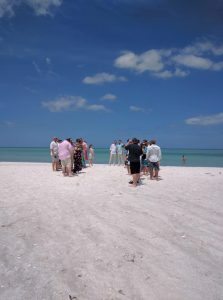 Nicole and James’ wedding ceremony took place in early May on a sandbar just off South Lido Beach in Big Sarasota Pass. They rented a Party Boat that left from Marina Jacks in downtown Sarasota to transport 50 guests out to the sandbar. Nicole looked amazing as she was escorted across the sand by her father to join James at the water’s edge. There, in front of their family and friends, and with an amazing view of the Gulf of Mexico as their backdrop, the couple shared their vows, exchanged rings, and were pronounced husband and wife by Rev. Rick Lackore of Sensational Ceremonies www.sensationalceremonies.com . Congratulations to the new Mr. and Mrs. James O’Donnell!